We were on a rural gravel road going through the rainforest when my aunt and cousin heard what seemed like a dinosaur roar and saw the trees shake. “Dustin, Dustin! Can you stop and go back?” I mean, sure why not. 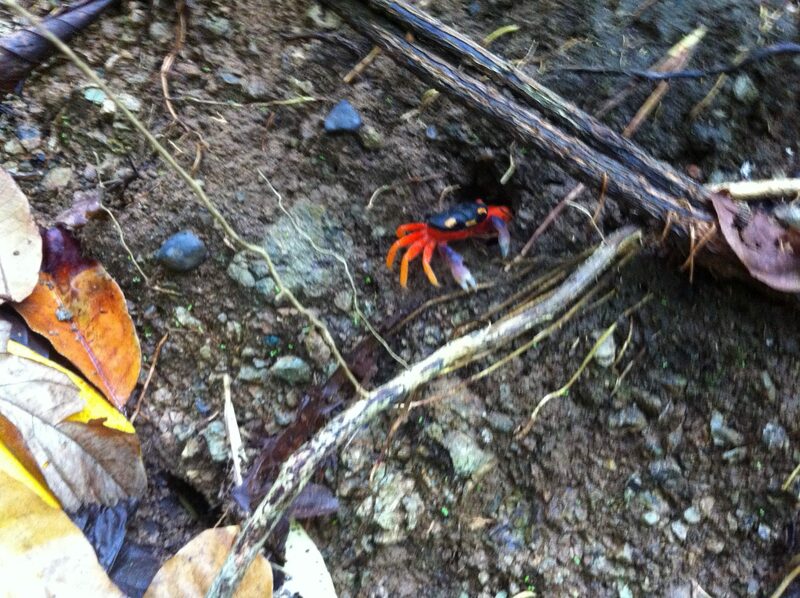 Jurassic Park was only filmed in Costa Rica. They didn’t really bring dinosaurs back to life, right? I slowly pulled to the side of the road and we began to crane our necks up toward the rainforest canopy to see what was going on. 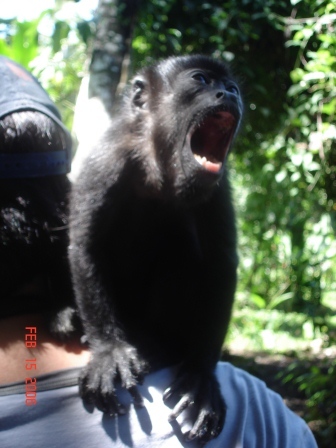 It turned out we had stumbled upon a pack of howler monkeys that really do sound like a T-rex. At first, I didn’t even want to get out of the car, as it was just another pack of monkeys in the trees, but my aunt had never seen monkeys in the wild. Thanks to her literally starting a conversation with them, we learned there was more than one pack, they were much closer to us than we thought and they had babies! I rarely encounter wildlife this far out from civilization, but when I do it’s special. With humans roving into all parts of the planet it was really cool to see monkeys that roar at you like they are trying to communicate with aliens. It was so far out, it felt like we were on another planet – or that I was in Jurassic Park, expecting a dinosaur at any moment. We never did see any dinosaurs, of course, but I know have a new favorite Jurassic Park moment, courtesy of my aunt. She showed me new ways to experience the rainforest, only a couple of months after I wrote a column about how it no longer excited me. Because she and my cousin were visiting me on vacation, we had decided to to find some of the most isolated and pristine beaches in Costa Rica, and that meant pushing the envelope. We took a ferry from the former port town of Puntarenas to the tip of the secluded Nicoya peninsula and hopped on a windy, two-lane road going into the mountains. Aside from a few small towns or “bumps in the road,” as my dad would say, all we saw along that road were vast expanses of farmland, national reserves and the occasional breathtaking view of the ocean. Eventually, the road ended and we came to the property. I call it that because we had rented a house, but it was nothing like what I expected. The jungle was amazingly manicured, and the “house” lacked doors and windows. This place had it all, minus the doors and windows. There were pools, gardens, a pool table, a private beach, and of course, plenty of bat droppings. There was a waterfall a five-minute walk from the property on yet another secluded beach that we would have visited more if we didn’t already have our own private beach to enjoy. I was informed this kind of vacationing was called “glamping.” and it’s something I would never have chosen on my own had I known what it was. I’m a sucker for peer pressure though and my aunt, who fears no risk, was in charge. She brought me a hammock with a built-in mosquito net so I could sleep on the balcony overlooking the sea. The first night was incredible, as a thunderstorm ended up putting us to sleep. I had envisioned myself dozing off to a music on my phone, but nature was too intense not to take it all in. One night, we drove to a nearby beach and were truly amazed. We hadn’t realized while walking along the tide line in the darkness, that we were right at the bottom of a cliff. When we started to hear waves coming from the shore we became so puzzled until we turned to see the sound was actually reflecting off the cliff we’d been walking along the base of. The water reaches the cliff during high tide, so this was really a treat, to see the underside of the sea and the caves and creatures that live there. On our way back, it started to rain a bit, and when we arrived, the jungle was alive and well. The sounds of the crickets, frogs, and the combination of the tap-tap of the water falling through the canopy made it jungle-spooky. It was just quiet enough for one errant sound to provoke sheer fear and… thankfully, no dinosaur sightings. But I had to get out of the car to open the gate, and at that moment I could have sworn I was in the movie. Looking back, I can’t get out of my head how wild that trip was. Next weekend, I’m traveling to the beach again and I am disappointed already knowing my lodging has doors and windows. It will be a relaxing, fun time, but it will quickly blur into all the other typical trips I’ve done to the beach. This one will stay with me, and the stories will probably get better over time. However, unlike that one time I almost caught a humongous fish with my uncle, I have video proof of my aunt talking to monkeys.